Is it permissible to say, "Pig Latin," these days without being jailed for engaging in hate speech or being accused of cultural insensitivity? ...not that I really care. 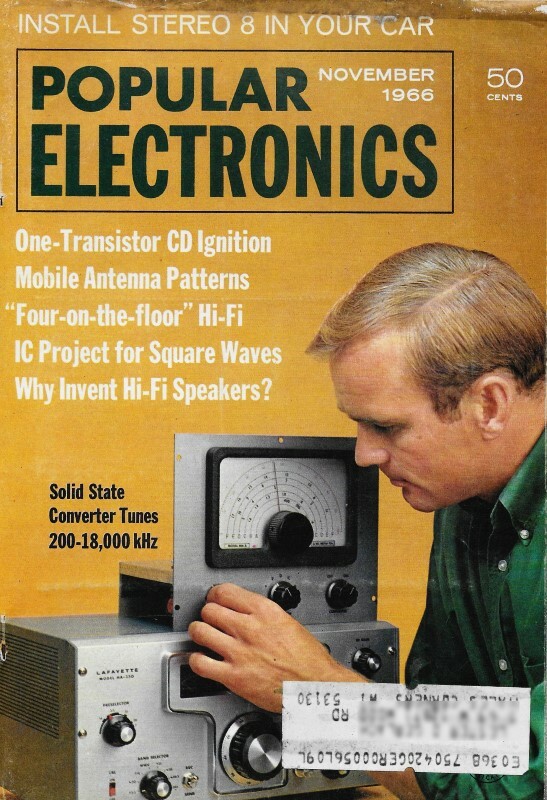 Carl Kohler's story from the November 1966 issue of Popular Electronics had me waxing nostalgic over a similar scenario from my own boyhood. It begins with Mrs. Kohler (aka "Goodwife") suggesting that she and Mr. Kohler resort to speaking in Pig Latin in order to prevent their mischievous sons from learning where the Christmas presents were being hidden. My parents did exactly the same thing to my sisters and me - and that was in the 1960's. My older sister, Gayle, and I made a point of learning Pig Latin ourselves in order to thwart the evil scheme. By the next Christmas we were able to discern that a certain corner of the attic was the secret hiding place. Our rancher style house's attic was not very big, but then neither were we at the time. We anxiously awaited the evening shortly before Christmas when our parents went to the holiday party put on by the local kids' sporting association, and had those pull-down stairs opened almost before the car got out of the driveway. It didn't take Gayle and me long to locate the stash. Believe it or not a pang of conscience hit us and we decided only to peek at what had been bought for our three younger sisters (Tina, Bonnie, and Brenda, in case you care - the last two being twins), who were not privy to our underhanded plot ...although I might have unintentionally seen a gift or two of my own - like a Hot Wheels race track set. I was cozily gnawing upon a buck's worth of licorice whips and browsing through my bound file of rare old Mad Magazine editions when Goodwife Kohler wafted into the room, her girlish features a study in tense caution. "Whatever shorted-out will have to stay that way," I bantered warningly. "The old soldering iron and yours truly are taking the day off, kiddo." "Eepkay ouryay oicevay ownday!" she hissed. "Watch that dirty mouth! Just because we've lived intimately, lo, these past twenty years is no reason for you to sully our meaningful relationship with questionable language!" "Libis-tiben tiboo mibee," she squeaked, switching from plebian pig-Latin into aristocratic carny without dropping a syllable in the process. "Hold everything, right there!" I favored her with a stern glance of disapproval. "First, you burst in here on tippy toes, ordering me to keep my voice down - and in sophomoric pig-Latin yet. Now you're emphatically suggesting, in cornball carny, that I listen to you. What's with all this wry-lingual action, anyway?" She peered nervously through the doorway, then silently closed the door. "Communication is going to be a problem for you and me, I'm afraid." "I thought I burned your copy of The Feminine Mystique, baby. Don't tell me that we still haven't resolved all that nonsense about communication between the sexes." "I'm talking about ordinary communication like holding everyday conversations without giving it away, see?" "Your quasi-logic is, as usual, cloaked in utter confusion. Precisely what are we trying to avoid giving away?" "The Christmas presents," she muttered tersely. "I'm talking about the Christmas gifts and our four nosey sons who have every intention of finding where I've hidden them and - "
"Okay," I said cheerfully, "I'll bite! Where did you hide the kids?" "Not the kids. The gifts. The kids are trying to find the gifts." "That figures. Sounds natural enough." 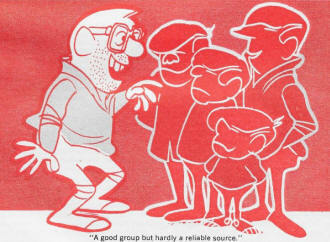 "Well, we might give the hiding-place away in a careless moment of daily conversation, so I got this marvelous idea!" She twinkled at me. If ever there is a clear-cut sign of impending trouble, it's when she twinkles at me. "Whatever it is - forget it!" "No, really!" she crooned gaily. "How can they possibly be tipped-off to the whereabouts of all those yuletime goodies - if we simply speak something other than English whenever we discuss the subject?" I pondered the point. Occasionally - just occasionally, mind you - she comes up with an idea more sound than I enjoy admitting. I try to discourage this practice on the grounds that it could lead to Thinking. "Ummm," I ummed noncommittally. "We both know pig-Latin," she said brightly. "So do the kids." "Carny?" "I taught it to them for laughs." She went silent, looking baffled. Apparently, we'd reached the limit of her language ability. Unfortunately, I found myself fascinated by the concept now. "What are they taking in school - besides Advanced Civil Disobedience and Elementary Sullenness?" "Spanish, French and German," she replied. "Okay, scratch the easy tongues." "Well, how can we keep from accidentally spilling the beans about the hidden gifts unless we find a way to discuss it so the boys can't possibly understand what we're saying?" "A good question. Not that I'm glad you asked it, you understand, but it's exactly the sort of problem my supple intelligence best grapples with, so why don't you go make it some coffee while I sit here and grapple a little?" She traipsed away in the direction of the coffeepot and my eyes began roving the shelves of books I've splurged my life's savings upon all these long, thriftless years. Suddenly, my gaze was braked to an abrupt stop by a title that fairly hurled itself into my vision: Morse Code Made Easy. "Why, of course!" I chuckled. "The grand old Code! Simplicity itself!" I took the book in hand, memories flooding back of those halcyon days when I sought a Novice Class license, diligently practicing hammering out the 26 letters, the 10 numerals, and the sundry punctuation marks as I spent hour after hour, day upon night, clicking the key in boyish hopes of developing a distinctive "fist" by which I would be known to the world of those who magically talked with their fingers across vast distances. "Even a cretin can master the code ..."
"Here's your java," interrupted my wife, placing a cup of something murky before me. "Dah-di-dah.!" I repeated, my knowing smile widening into a triumphant leer. "I'm merely inviting you to Transmit, gorgeous!" "Now, none of that!" she said crisply, stepping away from me rather hastily. "Drink your nice coffee-royal and behave - or I'm putting you on Sanka!" "Listen, I've found the language in which we can discuss Christmas and anything else you prefer to cover in front of the boys without them having the foggiest notion of what we're chatting about. 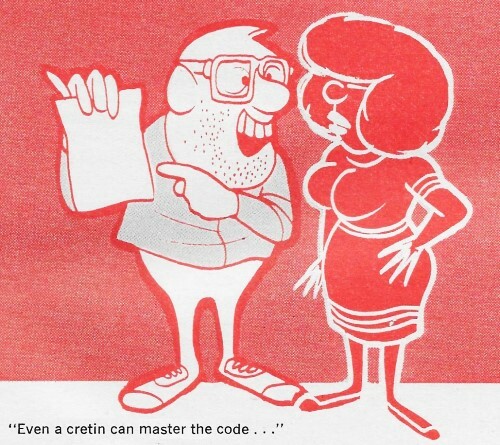 Naturally, it'll require some study and practice on your part, but even a cretin can master the Code, given a bit of time and patient instruction." I explained the Morse code to her, showing her the dot-and-dash graphics, detailing the structure of this form of signal, and concluding with an enthralling history of the entire subject. She sat with slightly glazed eyes, frowning into space. "Sounds hard," she remarked. "Not a bit." "I'm no good at languages." "No grammatical pitfalls in Morse, sweets." "Sometimes, I even have trouble thinking in English, and I'm always mispronouncing words." I sighed. "No accent variables in the Code." "Maybe we could both sign up at night school and study Sanskrit together or something? " "Listen, sister," I insisted flatly, "you are going to learn to speak Morse like an expert! I'll be patient and kind and calm as you struggle toward a total mastery of this simple communicatory system, but you shall learn it!" "And what if I still don't get it right?" Bending a steely smile of determination upon her, I said hoarsely: "You started this whole gig. You put this challenge in front of me. You're going to dit-and-dah like you were born with a bug for tonsils even if I have to cut a hickory switch - and use it!" The ensuing weeks gradually became a flamboyant carnival of daily sessions in which we checked out her memorization of the code symbols. Laboriously, she managed - at length - to memorize all of them, and promptly scrambled the entire combinations of dots and dashes into possibly the most unlikely language ever to contaminate the human mind. I introduced learning aids, such as the Allied Radio Code Course, and forced her to sit with a numb expression on her face - absorbing the actual sound of the code being transmitted at various speeds - while I washed the dishes, scrubbed floors and tidied up the place. Slowly, unbelievably, she began responding to the steady barrage of dots and dashes. "This ... is ... fun!" she ditdahed, finally, one morning. "I ... think ... it's ... great!" "Vunderbar !" I rejoiced Teutonically. "I was just about ready to put the project aside and go for a cram-course in Urdu!" "Please ... speak ... Morse," she requested. "Oh, come off it! The kids aren't around. We can converse safely enough in - "
"No ... speaka ... da ... English. Confine ... all ... messages ... to ... code ... or ... sign ... off!" "Not quite so fast," I implored. "I'm afraid - heh! heh ! - my ears are a trifle rusty, and you've been picking up speed quite magnificently until you're starting to sound like a semiautomatic machine!" She smirked a filthy smirk at me. Another week passed and the rotten little student achieved a delivery speed that left my ears echoing with an undecipherable chaos of dits and dahs, reducing my aplomb to a shattered wreck of its former glory. Nothing I could say would induce her to ease up a bit so I could exchange messages with her at a decent tempo. "Dit-dit-dit ; di-dah-di-dit, dah-dah-dah, ,di-dah-dah, di-dah-dah-dit, dah-dah-dah, dah-di-dah, DIT!" she staccatoed just slowly enough to be insulting. "Slowpoke, indeed," I murmured, crushed. "Well, now I know approximately how Dr. Frankenstein felt when his mistake turned on him!" Sadly enough, we were now back to the same communicatory gap as before, except the problem was that of a tempo barrier. Consequently, we spent no time at all discussing better hiding-places for the gifts which I assumed (since Smarty-pants had a monopoly on throwing money away, said practice commonly known as Shopping) were steadily piling up somewhere about the premises. I checked the situation out, surreptitiously, with my offspring. "Ya got me, man!" chortled #1 Son. "I ain't been clued to the gig!" "I don't know," sneered #2 Son haughtily, "and I wouldn't discuss it with an adult if I did, see?" That one's definitely executive material. My #3 Son was no help: "I'm still looking, but I'm getting real discouraged." And #4 (age seven) assured me: "Santy's gonna bring everything on Chrismuss night unless your credit rating's down the old tubes, pop!" 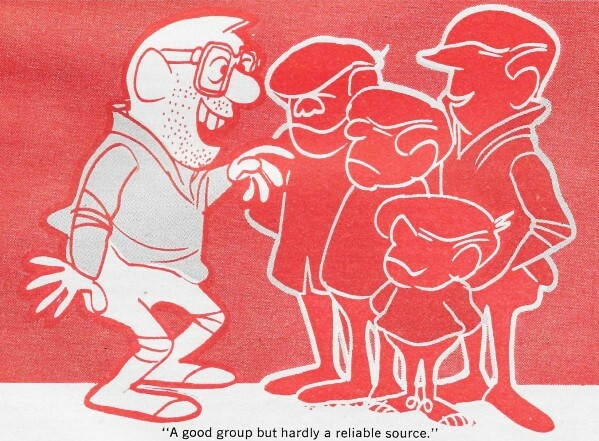 A good group but hardly a reliable source. Then, a few days later, Fate had pity on me and The Code Lady began infrequently mis-sending, her cockiness leading her into unwitting errors. At the same time, my ears finally adjusted to the tremendous speed of her fantastic Morsese. I, of course, stoutheartedly refused to reply to her jibes and inanities in anything except my own superb command of tarnished English, this ploy being a certainty to regain the upper hand. She dit-dahed vociferously, head held high, her tone that of a Vibroplex Bug with a snob complex. I laughed into her stunned face. "You may not realize it, toots, but you've just finished telling me that you've stashed '400-yards of pigmy thimbles northeast of the driveway valley' whatever and however that may or may not mean!" "I d-did?" she Englished uncertainly. "I meant to say I've stashed four dollars worth of wrapping paper in our closet until I can gift-wrap that Heath-kit transceiver we're giving our eldest boy." Which - heh! heh!- is actually what she did transmit, roughly, but I had her off - balance now, and too bad for The Code Lady. "Well, sweetheart," I said genially, "try again. Don't get rattled. You're an expert, remember?" This time, she dit-dahed a flawlessly detailed description of an Xcelite set of color-coded nut drivers that #2 Son, despite his considerable contempt for authority figures, was giving me. Secretly, I ached with envy at her splendid command of vocalized Morse. Outwardly, I managed an ill-concealed sneer. "What do you mean, 'a rolling discount gathers no diode logics?' It's a pretty phrase but the intrinsic meaning escapes me." Despair washed over her stricken eyes and engulfed her entire face. I was sorely tempted to stop this dastardly game but I am chronically disinclined to quit "when I'm winning. "Is th-that what I said?" she moaned. "Ummm," I nodded, looking slightly over her head as the falsehood hummed out of me. "Perhaps you've overloaded your mental circuits with the intensity of your enthusiasm for talking in Code. Might be a therapeutic idea to lapse back into clumsy old English for, say, a few weeks." "It's a deal," she intoned Englishly. "By the by," I chirped as casually as possible, "where have you hidden all the Christmas gifts away these many weeks, dear?" A crafty glint appeared in her eyes. "Nothing but English, remember?" I chided gently. "Mustn't break our word of honor, must we?" "Yeah, but how do I know you won't go groping around, snooping into gifts that you have no right to see until Christmas?" she demanded. "After all, all men are boys at heart!" "Perish the juvenile thought!" I descried. "Well, I haven't hid a single present in the house, if you must know. Everything I've bought is safely tucked away elsewhere." "And where, precisely, might 'elsewhere' be?" "Dah-dah-dit, di-di-dah, dit, di-di-dit, di-di-DIT !" Realizing she had no intention of ever telling me where all those goodies were being kept, I then proceeded to say several things - all of which were too unspeakably spirited even to be repeated in respectable Morse code. So I shouted them in butchered Esperanto yet. * Author's note for new readers: Morse Code for "Error"